Exhibition will be on till 8th April, 2016, Tuesday to Saturday, from 6 pm to 10 pm. London-based artists Jon Thomson and Alison Craighead originally conceived Here in 2011 as a virtual image for The Mini Museum of XXI Century Arts, an online digital media platform. The concept was to mark the distance of the work from itself along a North/South axis. The physical sculpture, fabricated to UK road standards two years later, marks the 24,859 mile distance around the earth and back (i.e. the longitudinal diameter of Earth). The current placement of this sculpture is particularly relevant in its current location on the Greenwich Meridian, which is located at 0 degrees. 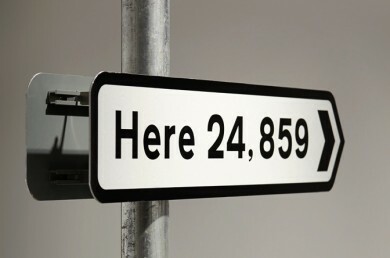 ‘Here’ was first made into this open edition digital photographic artwork for THE MINI MUSEUM OF XXI CENTURY ARTS in March 2011: a traveling musuem/digital media display originated by Italian curator Domenico Quaranta. This version of the work, developed by the artists, is a digital jpeg image file intended solely for display on screen. Jon Thomson (b. London) and Alison Craighead (b. Aberdeen) are fascinated how globalisation and networked global communications have been re-shaping the way we all perceive and understand the world around us. They live and work in London and Kingussie in the highlands of Scotland making artworks and installations for galleries, museums and site-specific locations that include the worldwide web. Recent exhibitions include: The Line Sculpture trail, London; Carroll/Fletcher Gallery, London; Zentrum Kunst Media, Karlsruhe; Haus der Kunst, Munich; BFI Southbank, London; Berkeley Art Museum, California; Artists Space, New York; Tang Contemporary, Beijing and Moderna Museet, Stockholm. Jon is Reader in Fine Art at The Slade School of Fine Art, University College London, while Alison is Reader in contemporary art and visual culture at University of Westminster and lectures in fine art at Goldsmiths University, London.